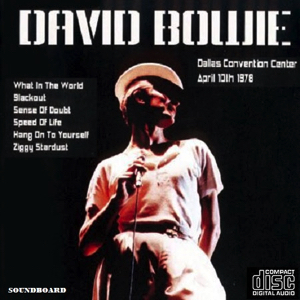 David Bowie 1978-04-10 Dallas ,Convention Center (Pre-Broadcast, LPCM Audio). A film crew of the American TV filmed the whole concerL,but only the above numbers were broadcast. This film was sold to many TV programmes in a large number of countries, and it has been often broad-cast partly or wholly,especially Blackout and Ziggy Stardust. Whenever in a documentary film or some other programme on Bowie you seeparts of these numbers,they are sure to stem from thisrecording. David Does Dallas. In 1978. I may have this entire show shortly (pre-fm).